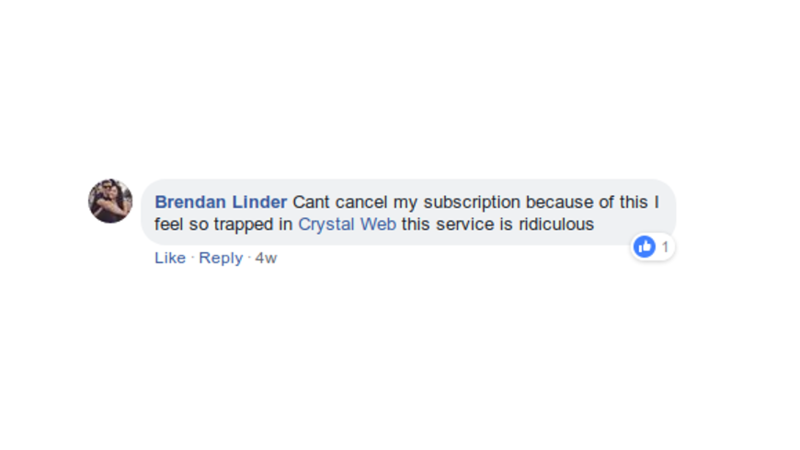 It’s been a tough year for Crystal Web. Once named the best ISP in the country in 2015 according to a MyBroadband survey, the company has been beset by issues in the past couple of months. Earlier this year, the company featured in headlines regarding a sustained, weeks-long DDoS attack that rendered the connections of most customers unusable. 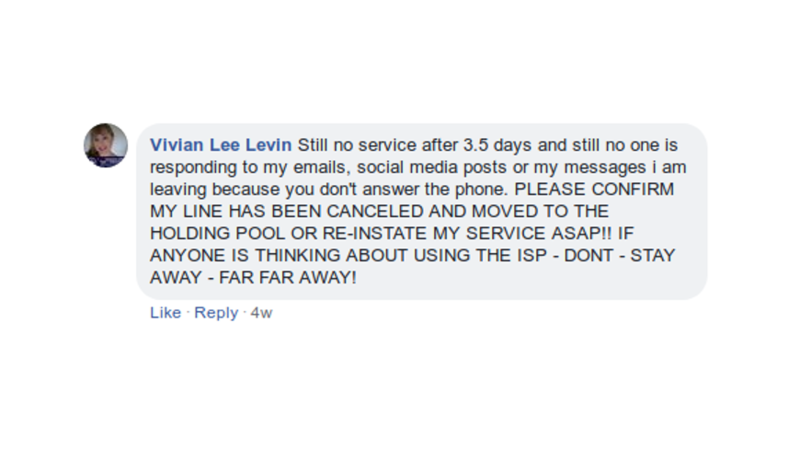 Over a month ago, customers began complaining once more about the company’s service, as masses of customers leasing ADSL and fibre lines, operated by Openserve, through Crystal Web saw their accounts suspended and connections rendered unusable. There are rumours of financial mismanagement, bankruptcy, and incompetence being shared on the local web, and customers are frustrated with the lack of an explanation as to what happened. 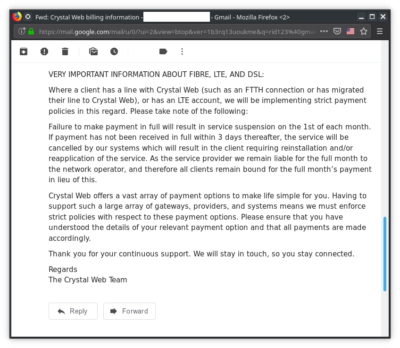 UPDATE: This article previously was titled “Crystal Web customers are threatening to leave the ISP after Openserve mishap”. 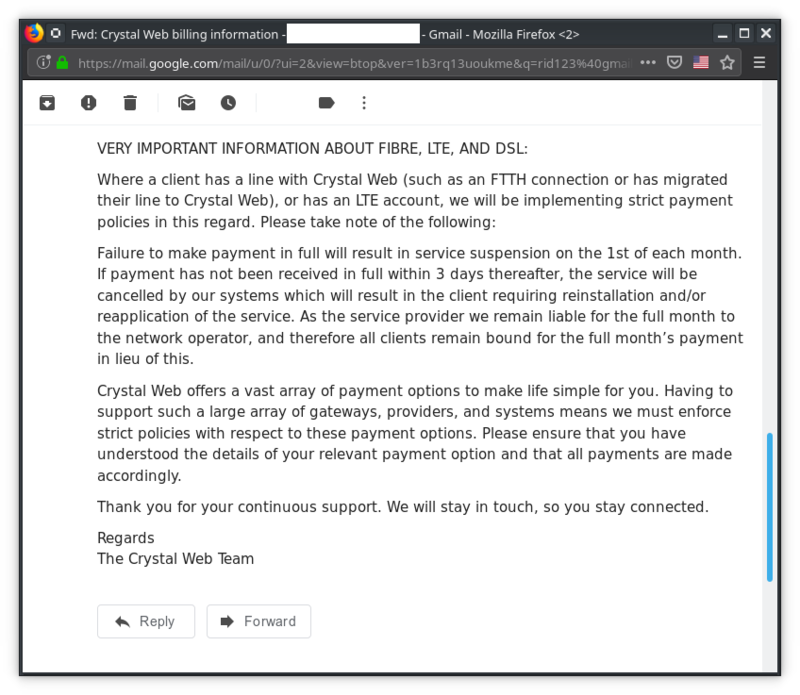 At the request of Openserve, it has been changed to “Crystal Web customers are threatening to leave the ISP after line rental disaster” to more accurately depict the events and details described below. Additionally, I have made changes to reflect the correct branding used by Openserve both in text and in imagery, and the opening paragraph has been edited to be clearer about Openserve’s involvement in this unfortunate saga. Although I have no relationship with Crystal Web as a company anymore as I was last a customer of theirs over a year ago, I do know one of its directors, Paul Hjul, personally. 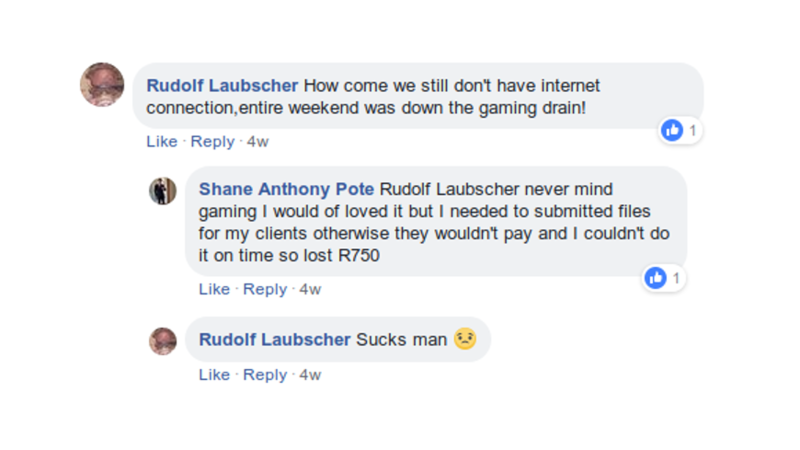 Paul lives in Jeffreys Bay not far from my house, and we’ve met a handful of times to discuss the local industry, the fixed-wireless last-mile expansion known as XtremeTTH that was under wraps at the time, and Crystal Web’s DDoS problems. We’re not friends, and our relationship is strictly professional. The past few years for Crystal Web has seen the company endure several problems which tested its resolve. In 2016, there was a data leak from a third party provider for the company’s portal website that compromised account security, and only a few months later the company was targeted by DDoS attacks on their fibre connections on Vumatel’s network. In 2017, initiatives started by the company designed to offer customers a fibre-like fixed-wireless connection on the company’s new product, XtremeTTH, were unsuccessful, and they shut down the “Champions” initiative designed to increase sign-ups in neighbourhoods that could be served by XTTH connections. Crystal Web at the time said they were in partnership with “a major search engine” that was investing in the initiative to bring fibre-like connectivity to more people. 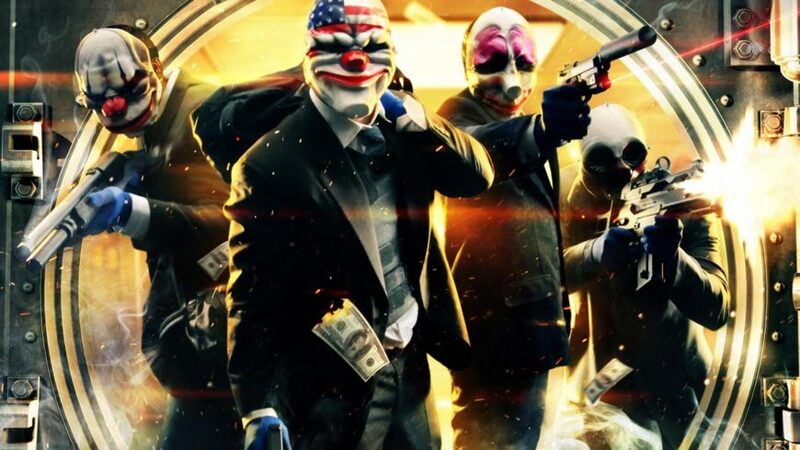 To date, the company has not announced any regions where XtremeTTH is available outside the NDA pilot sites. On 11 March 2018, Crystal Web officially began to move to EvoNet’s network and bandwidth. At the same time, Crystal Web was closing their contract with Internet Solutions and moving clients from the Internet Solutions network to EvoNet. The bandwidth allocated on the Internet Solutions backbone was dropped to a fraction of what it had been a month prior, and existing internet connections were impacted severely. 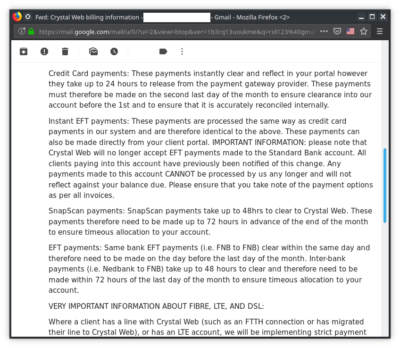 Customers that were still using their old IS-backed accounts were at a disadvantage as performance rapidly declined, and required a new username and account provided by the Crystal Web portal to access the new network. EvoNet’s transit provider at the time was Frogfoot networks. However, reports were posted on the MyBroadband forums about new EvoNet accounts that weren’t authenticating, as well as reports that not all customers received the email alerting them to the necessary account changes. There were also reports of EvoNet’s new network not performing optimally for downloads, streaming, or gaming, and that the capped accounts on EvoNet’s network were not set up to allow for concurrent connections. The 2018 DDoS attack began as the month came to a close, ramping up around 27 March as customers began noticing high pings and low bandwidth issues along with weird routes being taken on local and international paths. The worst of the attack was, funny enough, seemingly held back for a while by faulty switching hardware that had been detected on an upstream link owned by EvoNet. Fixing the fault opened the floodgates. Unlike previous DDoS attacks which affected specific types of connectivity the company offered, like fibre to the home (FTTH), this attack was aimed squarely at EvoNet and brought down connectivity for all EvoNet and Crystal Web customers. The attacks continued for weeks, and many customers left Crystal Web out of sheer frustration. The mitigations for this included purchasing additional network capacity on EvoNet’s network and purchasing new equipment with advanced DDoS protection systems in place. Over a month later in May 2018, the company finally acknowledged that it had suffered a sustained DDoS attack on the EvoNet network. Despite the assistance of the SAPS Commercial Crimes unit and the Hawks, the culprits for the DDoS attacks were never found. Crystal Web, once South Africa’s most promising and most consumer-focused ISP by a country mile, rapidly lost its hard-earned reputation among internet fundis and fans during this period, and may have lost much of the goodwill it had generated. The latest problem for the company this time it isn’t hackers, failed expansion attempts, or data leaks. It is instead a series of misfortunate events, and it was the company’s loyal customers that suffered disproportionately. NOTE: For clarity, the article continued below will have two ways of referring to “Crystal Web”. 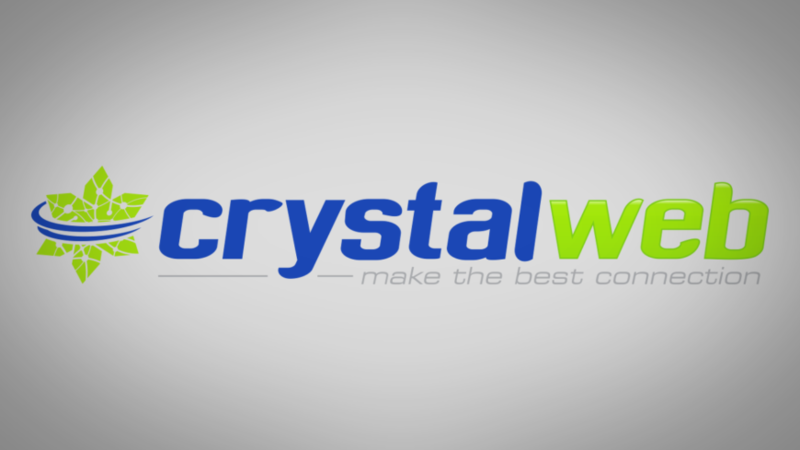 When referring to the company, Crystal Web (Pty) Ltd., its name will be unformatted. When referring to Crystal Web as a brand name (a necessary distinction given how the story unfolds below), its name will be italicised. In late 2017, EvoNet sought to acquire critical parts of Crystal Web’s business, chiefly its customer book, and engaged in talks with the remaining directors of the company, including co-founder Paul Hjul, to purchase the customer book for an undisclosed sum of money. I met with Hjul on Friday, 9 November 2018, to discuss the issues the company was having with Openserve. According to the terms of the deal, Hjul would be left with the company and its brand as the sole proprietor. For EvoNet, this would turn Crystal Web, the brand, into an EvoNet client and reseller, of sorts, of EvoNet’s services to end-users. The initial negotiations for the purchase of the client book started sometime between August and October 2017, well before the decision to use EvoNet as the supplier for Crystal Web’s bandwidth. By 1 March 2018, a price had been agreed upon and a core agreement was verbally agreed upon, which required shareholder approval and, Hjul says, would necessarily kick off a regulatory process for the deal to be completed by 1 October 2018. The deal was signed in September 2018. A crucial detail to this deal was that the price for the customer book was agreed upon before the transfer of the customer book was completed. While a figure for the transfer couldn’t be given to me, Hjul did say that the amount that EvoNet would pay to Crystal Web was determined based on the value of client base at the time. Hjul stressed that he had not taken an active role in running or managing Crystal Web since June 2017 and was not involved in any board decisions. He admits to being a signatory to the agreement to purchase the client book, and disclosed that he had been involved in the re-negotiations that lead to the drawing up of the current agreement. In follow-up questions posted to Hjul via email, he also disclosed that he had had his access to financial records revoked in November 2017. Hjul stated that he only had access to financial statements for the company starting in August 2018. Part of growing, becoming better, becoming part of something bigger, is embracing change. After months of talks and negotiations, we at EvoNet Pty Ltd are proud to announce that we have concluded the acquisition of the Crystal Web client base effective immediately. While this is a big change, the sole intent is to make your online experience a better and ever improving one. Crystal Web has made use of the EvoNet network since the beginning of 2018 so you can expect only bigger and better things from your internet connection. This move to EvoNet is part of our strategic mission to achieve internet perfection: cheaper, faster internet for all. As a part of this process we’re excited to announce a first for you: EvoNet is the first retail ISP in South Africa to take up major capacity on the 40Tbps South Atlantic Cable System. This is a brand new cable system connecting the Americas directly with Africa, and means that our Fibre to the Home (FTTH) customers will enjoy incredibly low latency and greater internet speeds to North and South America as of the start of next month over our world class network. Just one of many firsts EvoNet will bring to the game. We will begin to transition our Telkom-IPC clients over to this new capacity in the coming weeks. We extend our utmost gratitude and support for Crystal Web’s founding shareholders, Shaun Kaplan, Paul Hjul, and Karen Charlton, all of whom will move on to bigger and better things outside of the EvoNet family. Paul will continue to advocate for the industry and work in developing a gig economy and hopes to see as many members of the old Crystal Web family as possible at AfricaCom 2018. Shaun and Karen will both move out of the telecoms space onto new and exciting opportunities. We look forward to starting this new journey with you and can guarantee that things will only get better from this point on under EvoNet, together with its shareholders and directors. EvoNet is owned and managed by industry and entrepreneurial veterans, namely Andisile Bam (Marketing Director), Thandile Fikeni (Business Development Director), Tim Germond (acting CEO), and Kristian Le Gonidec (Head Of Fibre Builds) and will leverage our team of industry experts over the coming months to introduce new and exciting opportunities for all EvoNet clients. Our combined experience in building Fibre To The Home networks is core to EvoNet’s strategy of delivering world class internet to all South Africans. Thank you for becoming EvoNet’s newest partner and friend. We will continue to embrace the Crystal Web brand however you can expect exciting and game-changing announcements in this regard soon. To moving forward and moving upward with you. As of 1 October 2018 the full terms of the deal came into effect, which were primarily that the client book was fully handed over to EvoNet, and that Hjul became the sole shareholder and director of Crystal Web (Pty) Ltd. Included in the terms were licensing rights to the Crystal Web brand by EvoNet for a period of five years in the ISP market. The client book for Crystal Web was actually handed over as the deal was verbally agreed to on 1 March 2018 in order to begin the migration of customers to EvoNet’s network, but full ownership including username changes only took place after 1 October 2018. The clause regarding the branding should be noted. It plays a big role in the messaging that EvoNet and Crystal Web has been putting out recently, and causes confusion for Crystal Web’s clients that are not made aware of the difference between the company and its brand. Crystal Web, the company, has nothing to do with Crystal Web, the brand, at this current time. The brand still belongs to Hjul, but EvoNet’s five-year term to use the brand means that they benefit off an existing brand while building up their own to replace it. On paper, the customer base had value to EvoNet, and that value was contingent on the subscriber numbers staying either above a certain threshold, or increasing in the time between when the negotiations completed and when the transaction was finalised. The purchase would only make financial sense to EvoNet if the customer base could generate enough revenue to offset the cost of acquiring it. If enough customers were to leave Crystal Web before the deal was completed, it would no longer hold the same value. But Crystal Web did lose customers. It lost customers as a result of the DDoS attacks in March, and it lost customers as a consequence of what appeared to be an ill-timed move to EvoNet’s network. It lost customers to competitors as they too began offering fibre connectivity, as a result of the company losing its high-quality news server partner for downloads, as a result of a decline in the quality of their customer support as evidenced by numerous consumer complaints on Crystal Web’s dedicated thread on the MyBroadband forums, and as a result of other ISPs offering cheaper pricing for a similar product. Mid-way through the deal for the customer book being finalised, Crystal Web was losing revenue. Much of that sunk cost was due to having purchased the rather expensive DDoS hardware mitigations put in place to defeat the DDoS attack as well as more bandwidth to keep their customers online. In the local ISP industry, bandwidth contracts are typically drawn out for a period of 3-6 months, at the end of which the contracted amount can be raised or lowered and the contract updated to reflect the pricing changes for the next period. If an ISP bought more bandwidth in response to a DDoS attack, and lost customers as a result, they would still be paying those higher fees and waiting for the contract to reach its renewal date so that they could save money. In response to a follow-up question sent to Hjul, he admitted that he had been aware of “risk to clients and staff arising from financial constraints on Crystal Web and this motivated the EvoNet acquisition.” Crystal Web’s plan, it seems, was to sell off their client base, sell off the company’s brand, and start over. That plan was put on hold as EvoNet disputes the value of the client book as things now stand, causing further financial complications. “I verily believed (and believe that contractually if honoured) the transaction would benefit clients and that honouring of the contract by EvoNet would see the risk subside to the benefit of staff and clients. It never occurred to me that EvoNet would allow a situation in which the client book would be negatively impacted,” said Hjul. In emails sent to me from current and former Crystal Web customers, there is a brief moment when it appeared that a split was forming inside the company, already internally struggling financially. 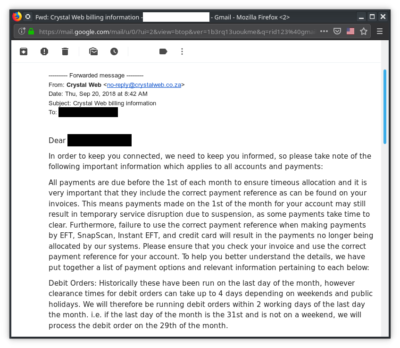 On 20 September 2018, an email was sent out to all Crystal Web customers informing them of changes to payment schedules moving forward. All payments are due before the 1st of each month to ensure timeous allocation and it is very important that they include the correct payment reference as can be found on your invoices. This means payments made on the 1st of the month for your account may still result in temporary service disruption due to suspension, as some payments take time to clear. Furthermore, failure to use the correct payment reference when making payments by EFT, SnapScan, Instant EFT, and credit card will result in the payments no longer being allocated by our systems. Please ensure that you check your invoice and use the correct payment reference for your account. 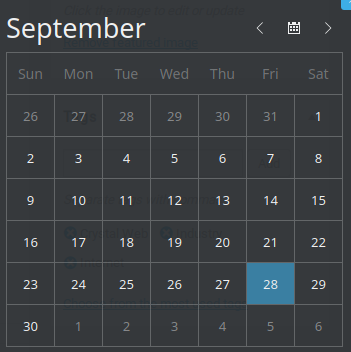 In the past, Crystal Web allowed for customers to pay in myriad ways including regular EFTs, and set up their billing system to run on the 19th day of each calendar month, generating invoices on the 23rd day (a change that was introduced early in 2018 after customers requested the early generation of invoices for tax purposes). 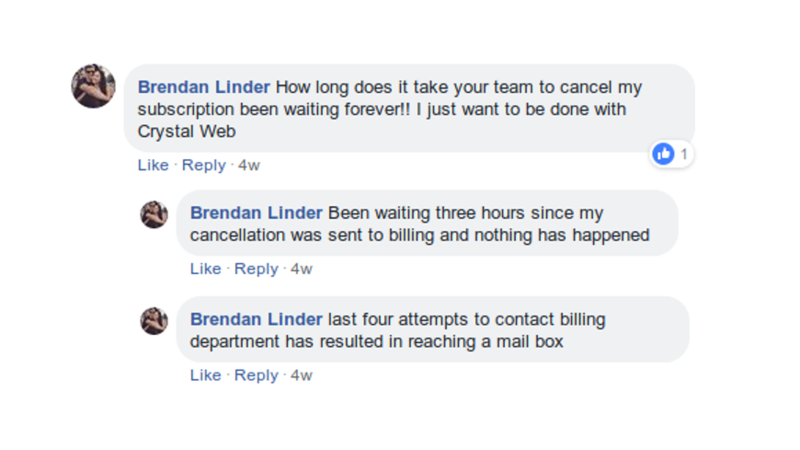 In the event that a customer forgot to pay their account, or was late in payment, or were having financial difficulties, Crystal Web’s billing staff would manually reconcile outstanding accounts so that customers were not disconnected improperly. The new system was a lot more complicated. The company announced that debit orders would be run within the last two working days of the month, that customers who used credit cards or Instant EFT had to pay in a day before the last day of the month, and that Snapscan and EFT customers had to pay up to three days in advance of the last working day of the month. 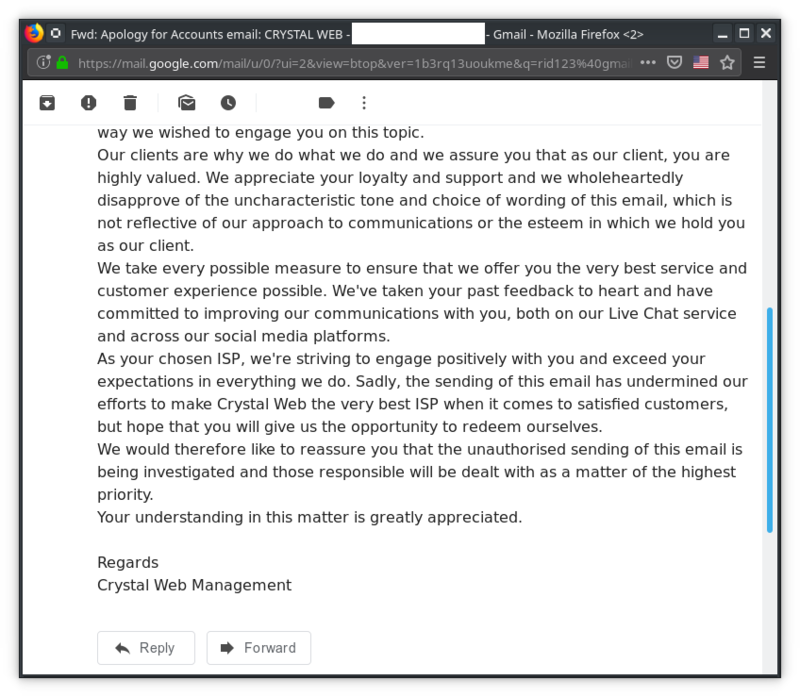 Later that day, a follow-up email was sent out from Crystal Web management revoking the previous one. It was light on details about why the earlier email had been sent out, who sent it, and what necessitated the changes to the payment times. This email was not sanctioned by our executive and senior management team, and while we have been working on a general communication to send to you regarding adjustments to our accounts and payments policies, this most certainly was not the way we wished to engage you on this topic. Our clients are why we do what we do and we assure you that as our client, you are highly valued. We appreciate your loyalty and support and we wholeheartedly disapprove of the uncharacteristic tone and choice of wording of this email, which is not reflective of our approach to communications or the esteem in which we hold you as our client. It does appear that clients were told ahead of time to pay Crystal Web before the 1st day of October 2018 in order to secure their finances and to be able to pay the leased line provider for the month in advance as soon as October began. Whether that was the actual motivation for the emails is unclear. As a result of financial losses and constraints for the company, it was inevitable that management would move to pay certain creditors at certain times to optimise their cash flow while they waited for the sale of the client book to conclude. All companies in financial distress will do this as a way to keep their partnerships going right up until they run out of cash, in the hopes that a revival or some debt relief will be incoming. We saw it happen with THQ, with Crytek, and most recently with Telltale Games. We read about it daily in news headlines about mismanaged South African State-Owned Enterprises (SOEs) that fail time and again to pay their creditors. For Crystal Web, this resulted in Openserve not being paid line rental fees for the customers whose leased lines managed were by the company on their behalf. There just wasn’t enough money to go around, and the company defaulted on their payments. Paul Hjul acknowledged to me that the first he had learned about a potential default on fees owed to Openserve was after the lines were suspended on 5 October 2018. According to Hjul, an acknowledgement of debt (AOD) was signed by Hjul’s partner shareholder in the company Shaun Kaplan, and the deadline for payment of the oustanding fees was 28 September, one week earlier (a Friday). Kaplan and another Crystal Web director and shareholder, Karen Charlton, left their respective positions in the company when the deal to purchase the client book concluded on 1 October 2018. Hjul revealed that the amount outstanding owed to Openserve is approximately R2 million. This includes leased lines on Openserve’s fibre and ADSL last-mile networks. On the afternoon of Friday 5 October 2018, the reports started piling up on social media. 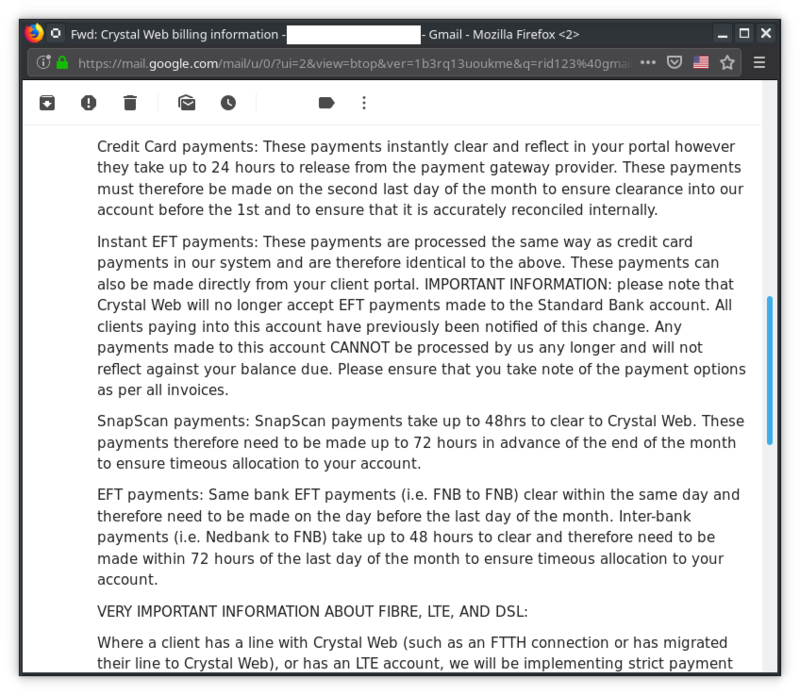 Customers were struggling to connect to their accounts, and Crystal Web’s support channels were flooded. Some customers only had their ADSL subscription suspended, while others had the misfortune of having their telephone lines suspended as well, leaving them without a phone line to call Telkom. 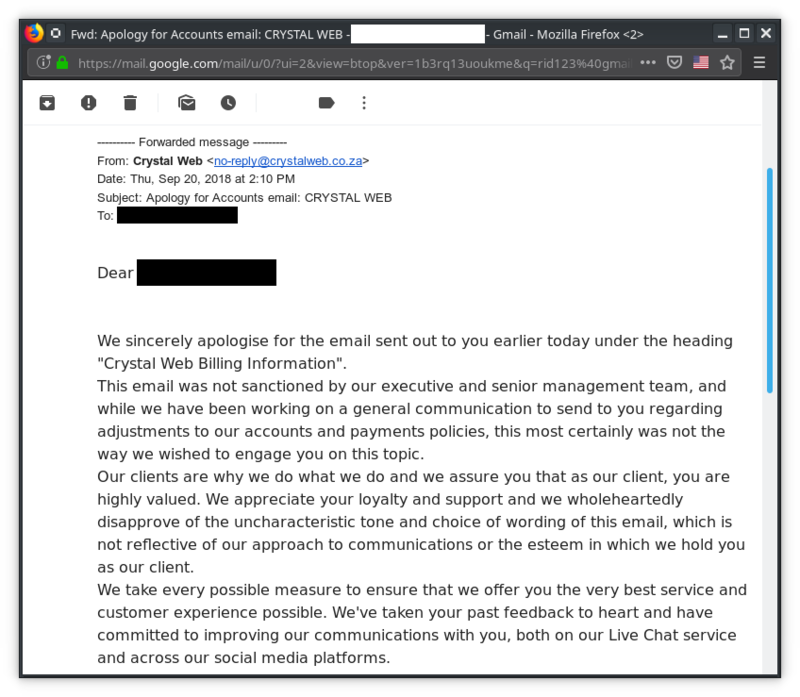 Across both their social media and in their support’s communications to clients for most of the day, Crystal Web continued to tell customers that the issue was a technical one. Communication with “Support General” pasted into one post labeled it as a “network outage”, but no outage reports were issued by Openserve at the time. 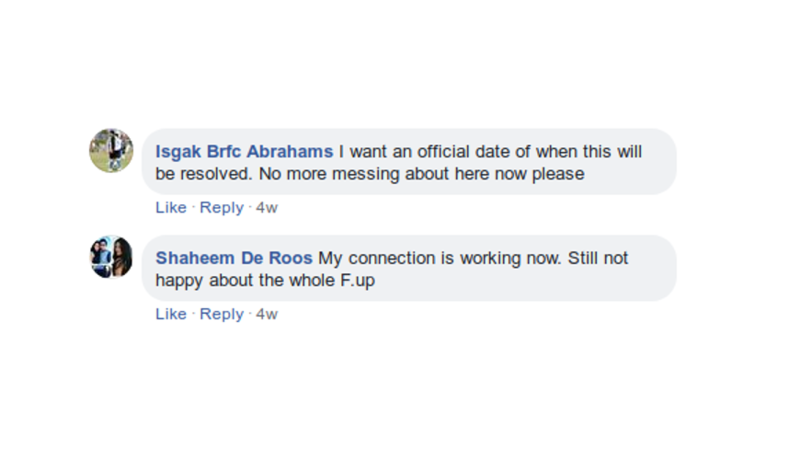 Correspondence with “Support Major” on 6 October yielded a new excuse that “Telkom is taking longer then expected to restore our line as they had not yet signed the new contract with Telkom but it has been done now so its just matter of restoring all lines”. An image shared with me by a former Crystal Web client showing their line was suspended. 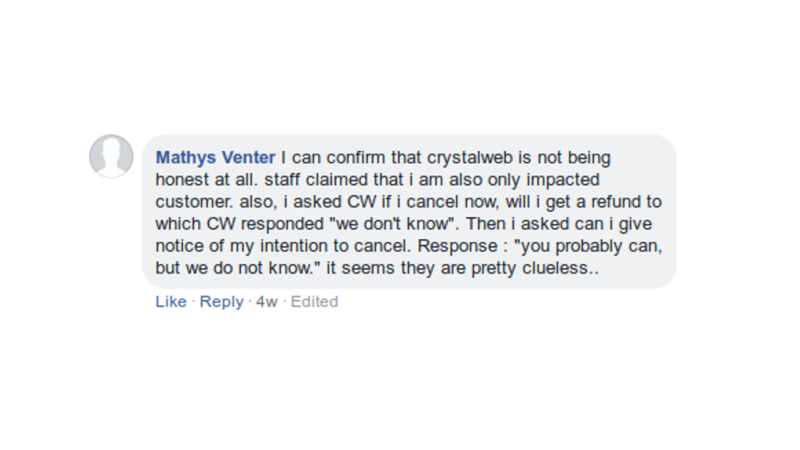 That same post shows that Crystal Web’s upper management staff were not available to speak to customers contacting the company through the chat lines on Saturday. 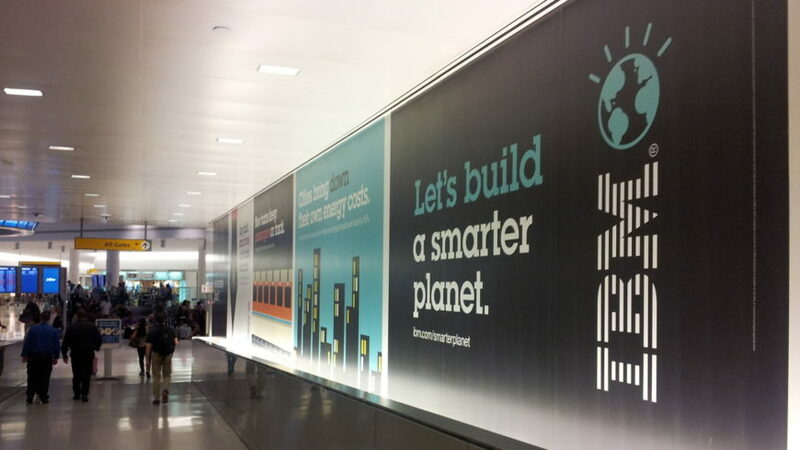 Crystal Web logs the daily performance of their client port’s ability to respond to requests. Despite customers being told that there were network outages, known connectivity issues, or problems with porting the lines over, no network notices to mark this were put up on the company’s website. 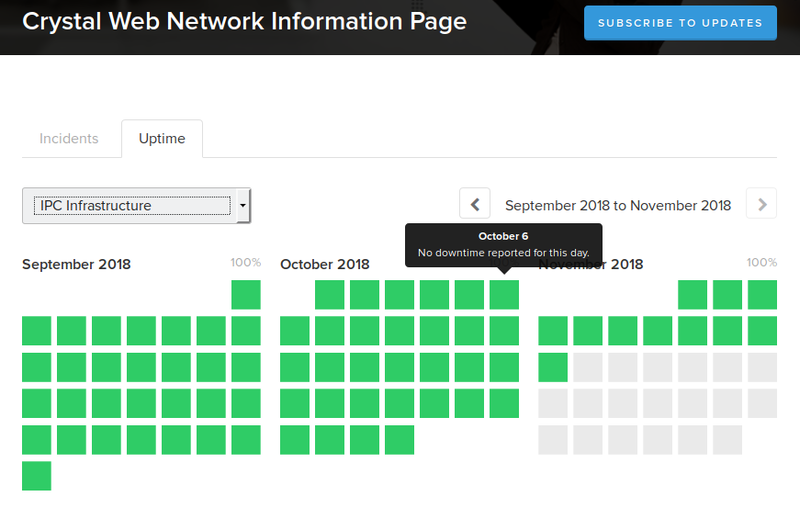 There are no marks reported on the Uptime page, and there are no incidents reported for October 2018. One metric reported on their page, the Client Portal response, is something to note though. It has seen regular, heavy use in the past month. On 8 October, posters on the MyBroadband forums began confirming that they’d sent in their cancellations. 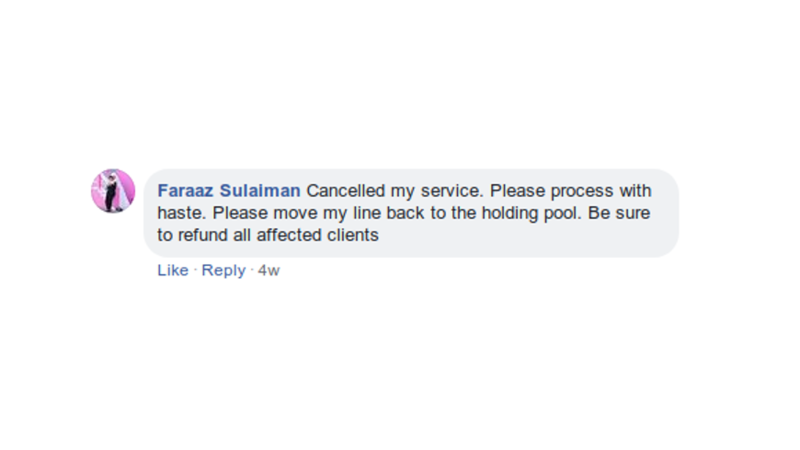 On the company’s Facebook page, customers complained that their cancellations weren’t being put through on time. No refunds for the downtime were offered to customers. We would like to apologise for the loss of connectivity you have experienced since Friday. We initially thought this was a technical issue, and engaged with Openserve’s technical team on Friday morning to find out what was wrong. 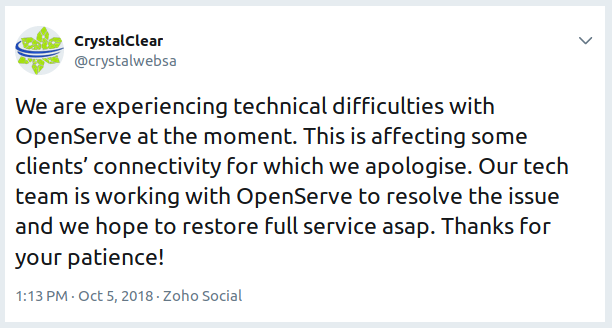 Sadly, we eventually learned late on Friday that Telkom lines were not moved from Crystal Web to EvoNet the way they were supposed to, and the result is that Openserve have temporarily suspended Crystal Web’s services as they no longer retain a client base. We were unable to resolve this issue over the weekend as the Openserve commercial team was not available. As EvoNet we have and continue to urgently engage Openserve to ensure that all clients are properly migrated over and that all services are restored. We have also engaged with Crystal Web to assist where we can to resolve this matter. We are expecting an update from Openserve later today, after which we will be able to update you all further. To say we are sorry for the inconvenience would be an understatement, but like you, we have been very much in the dark as to what has happened and why, as we began the transition process fully believing that everything would run smoothly and with everything on our side in place. It seems that communication was not as effective as it should have been and very much out of our control, however our senior management are working to ensure that this is no longer the case. We can only assure you that we are doing our level best to resolve things and have the Telkom lines successfully migrated and remain committed to as smooth a transition as possible. The explanation given by EvoNet here is that Crystal Web’s leased lines for fibre and ADSL were suspended because the latter no longer retains a client base. 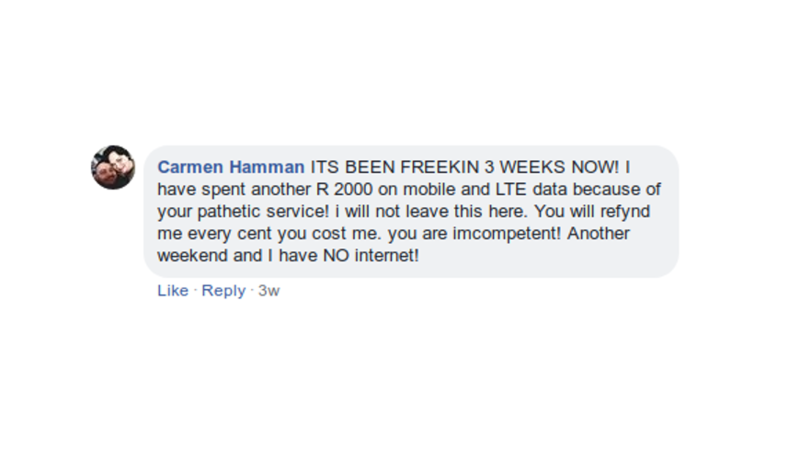 This contradicted customer’s experiences in contacting Telkom to find the real reason for the loss of connectivity, and it contradicted the support staff’s earlier excuses to clients that there was a known network outage, or that there was an outstanding contract that Openserve had yet to sign. EvoNet shifts further blame from itself by saying that “Telkom lines were not moved from Crystal Web to EvoNet the way they were supposed to”. As you know, EvoNet recently acquired the Crystal Web client base. Crystal Web remains an independent and privately owned business and will continue under new management. Once we acquired the Crystal Web client base, and in order for Crystal Web clients to benefit from the acquisition and EvoNet’s new, state-of-the-art Internet Service Provider offering, existing client lines needed to be transferred, or migrated, to the EvoNet platform. This migration was supposed to have happened seamlessly but sadly, due to a dispute between Crystal Web and Telkom’s Wholesale arm Openserve, this has not happened. The result is that Openserve has effectively frozen the Crystal Web service, leaving some Crystal Web clients without connectivity. EvoNet has stepped in to try and assist and facilitate between Crystal Web and Openserve to the best of its ability and has been working hard behind the scenes to find a resolution between the parties as quickly as possible to limit the negative impact on our new clients. 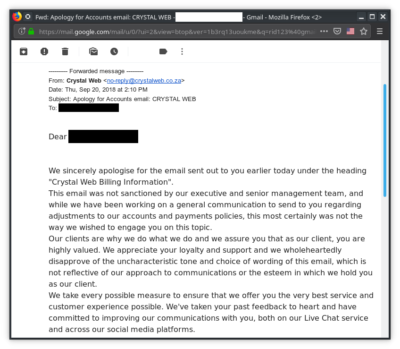 As of the time of this release, we are continuing to liaise between Crystal Web and Openserve in the interest of assisting our newly acquired clients and speeding up the transition process, but sadly there is no update on the situation, which was entirely unforeseen on our part. It is very sad that Crystal Web’s clients are in a situation where they are the ones suffering as the result of a process that should have seen them seamlessly migrated to EvoNet. 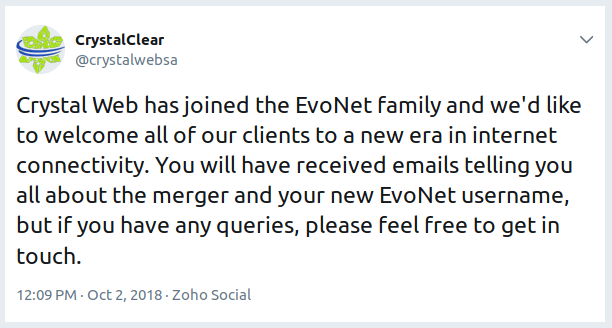 This is not at all what we, as EvoNet, anticipated but we do hope to help bring this dispute to a settlement and have Crystal Web clients migrated, along with their lines, as quickly as possible. Where EvoNet has had control, all other services have transitioned with little to no impact, such as DSL data, LTE services, Vumatel and other FTTH operators, however in this instance the control doesn’t rest with us and we were caught unawares of the issue, particularly with it being a matter unrelated to EvoNet. Rest assured that EvoNet ISP takes its responsibility to its newly acquired clients exceptionally seriously and our team will be going the extra mile to ensure that the transition suffers no setbacks. In the meantime, thank you for your patience and understanding. This second release did nothing to stem the tide of cancellations or angry customers contacting the support channels. Here EvoNet continues to separate themselves and Crystal Web as if they were different companies entirely unrelated from one another. Legally and on paper this is true. EvoNet and Crystal Web are separate entities and do not share finances, bank accounts, upper management staff, or executives, although there may be shareholders and board members with interests and responsibilities to both companies. But in reality they were very closely linked. 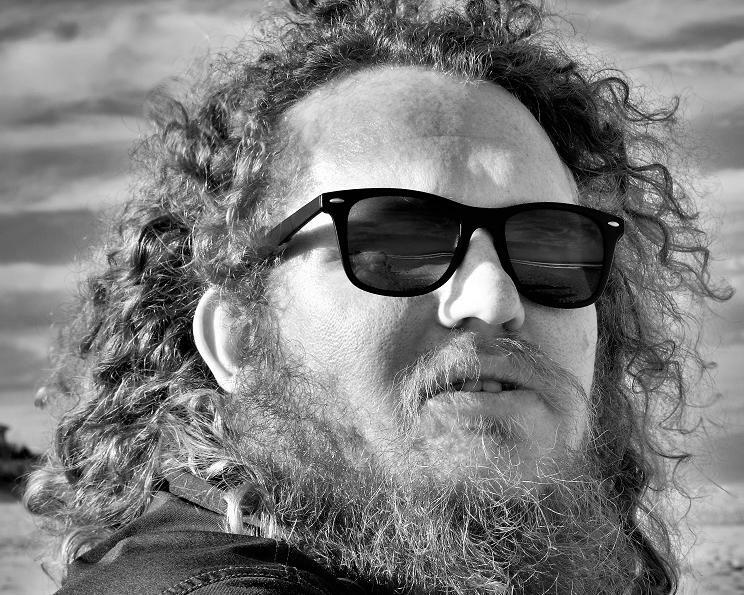 Shaun Kaplan founded both Crystal Web and EvoNet. EvoNet’s co-founder, the late Brian Seligmann, was one of Crystal Web’s investors, and started up EvoNet in partnership with Kaplan. When EvoNet was granted an autonomous system (AS) number to operate as a bandwidth and web hosting provider, Seligmann and Kaplan listed their names on the company’s WHOIS record and shared the same street address, a residential home in Farramere, Benoni. Depending on which database you use, AS328239 shows up as either EvoNet or Crystal Web. EvoNet’s first product, XtremeTTH, was marketed as a Crystal Web product. Crystal Web partially bankrolled XtremeTTH rollouts and trials. As the sister companies relied on each other more, things became more intertwined. “Crystal Clear Fibre to the Business” became “EvoNet Fibre to the Business” (and trying to click on the Openserve offering for FTTB just loads the EvoNet FTTB page). The companies even have similar phone numbers one digit apart – 010 612 0001 for Crystal Web and 010 612 0002 for EvoNet. Visiting evonet.co.za (and here you should hover over the link to verify for yourself) redirects you away to crystalweb.co.za. In researching this story, I contacted EvoNet’s Tim Germond, CEO, to clarify things further and get some answers about what was going on. I posted several questions to Germond which he has replied to, and have posted both below verbatim (with some formatting to separate the questions and answers more clearly to make it easier to read, and to insert a missing word where the sentence didn’t make sense). Germond was happy to answer questions regarding the situation, and I will be following up with him in the future to stay appraised of the situation. To clarify, these questions were sent to Germond a day before my meeting with Paul Hjul. The information I had at hand to formulate the questions was already available in the public domain. At the outset I must clarify that Crystal Web was never a subsidiary of EvoNet, but was, in effect, a client of EvoNet, using its superior network services. The upper management was not shared between the two however the initial idea was that there were board members that the two entities would have in common, which is not unusual. However as time has progressed this initial view has changed and EvoNet does not share any upper management, board members or Shareholders with Crystal Web. Firstly EvoNet has had no dispute with Openserve, what we have done it try to assist in sorting out an issue between Crystal Web and Openserve. And, in fact prior to the discovery of Crystal Web’s mismanagement of the migration there was no dispute between EvoNet and Crystal Web. Q: How many Evonet customers were affected by the switch which suspended their line? A: This question is difficult to answer as a number of the affected customers belonged to resellers. Q: When did the issue start, or when was it discovered? Was it as the customer base was being moved from CW to Evonet, or after the transfer was complete? Was a halt called to the migration to prevent more customers being affected? A: This is a question that should be directed at Crystal Web as they were in charge of the migration and EvoNet is not in a position to speak on its behalf. We first discovered it when the effected clients contacted our support staff saying there were unable to connect. This is when it was discovered that Crystal Web had not managed to migrate those lines across to us. Q: Is there any truth to the rumours that ADSL line accounts were unpaid by CW management to Openserve, thus creating the dispute? A: Again, this is a question that needs to be directed to CW and not EvoNet. EvoNet is not part of CW and we are [not] privy to its contractual relationship with Openserve. EvoNet has tried to intercede in the issues that arose as a result of the migration but is not in a position to comment further. 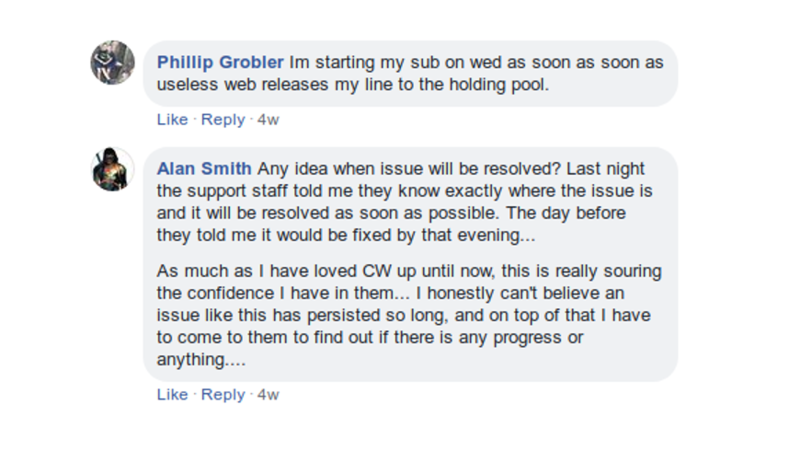 Q: I have additionally heard that the unpaid accounts issue was not something that CW management acknowledged or notified Evonet of before the migration took place, and may have tried to hide. Is there any truth to this rumour? A: EvoNet is a self-standing enterprise and it is not privy to CW’s financial situation, nor to its day to day management. Q: Initially Evonet/CW notified customers that the issue of their lines being suspended was a technical one, and a notice was put up on the CW site about a loss of connectivity for ADSL users. Why weren’t customers notified about their line being suspended, instead of the issue being publicly announced as a technical one? A: I am not able to comment as to CW communications with clients and who or what was posted on the website or relayed to customers. Any communication that was sent out from EvoNet at the time was informed by CW, who had been handling the migration, as we were initialy not informed of the line suspensions. Q: On 8 October, Evonet sent out an email to customers stating the problem and promising that the company would work to find a solution to the problem. Just over a month later, what is the status of the migration? A: This is a very unfortunate situation and one that was could not have been foreseen by EvoNet. We have tried to intercede on CW’s behalf to no avail, as Openserve refuse to open up conversation with us. The migration has not yet occurred and we are exploring every possible avenue to resolve this issue. Q: Moving forward, what will become of the relationship between CW and Evonet, and will the companies part ways? As you have the client base under your control now, it would seem that your business relationship with CW is no longer required. A: As I have mentioned the Companies were never joined, nor was it the intention that they be joined. CW was, effectively, a client of EvoNet and NOT a subsidiary. Unfortunately I am unable to make any further comment on this as it falls directly fall under the sub judice rules. Additional questions have been posted to Germond to follow up on his answers here. 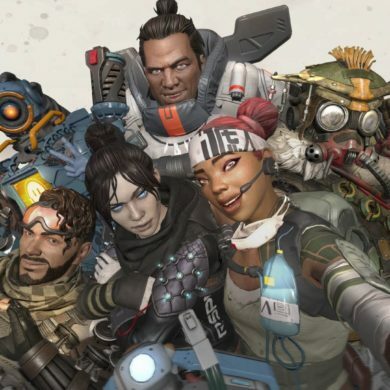 Should they arrive in my inbox at any point, they will be included in this article as an update. For the time being, all three parties involved in this situation are at an impasse, and will be negotiating closure to this saga in the coming weeks. I have been informed by Hjul that as of 19 November 2018, the matter between Crystal Web and EvoNet has been handed over for ligitation in the courts. “While I have made every good faith endeavour to move forward without litigation this has proved fruitless and litigation is being prepared for, barring some significant development towards a reasonable and lawful resolution,” Hjul stated. Openserve is also preparing to commence litigation against Crystal Web for their outstanding fees. Whether or not the agreed upon price or a revised price is settled on, it’s all the same to Openserve – in their books, Crystal Web owes Openserve money for ADSL line rental fees, and it’s up to Crystal Web to pay their due. But as I’ve already outlined above, Crystal Web and EvoNet are/were sister companies, with the former undergoing financial difficulties. EvoNet is looking to absolve themselves of any financial responsibility for the outstanding fees, but the reality is that they may be able to afford to settle the bill to serve their customer’s immediate needs. What made up Crystal Web as a company in totality two months ago no longer exists. All the branding on the Crystal Web website, the website itself, its advertised services, and its social media accounts are being used by EvoNet as part of the agreement terms. The separation between the company, the brand, and EvoNet has rendered the situation very confusing, and it’s unclear what course the legal challenges will take as time progresses. As for what remains of the company, Crystal Web, the future is uncertain. Hjul noted to me in our interview that he was not sure whether the company would continue to exist, or if he should close down and decide to relaunch its brand at a later date. “I’ve always introduced myself to people as the founder of a failing startup, and I guess it’s now, finally, an actual failed startup,” he says candidly. If you’re currently a Crystal Web customer who has a leased line through the company, there is hope for you. If you are still sitting with a suspended line, you may contact Telkom’s call centre and choose to speak to an agent in the billing department. Explain that your line is suspended because your ISP did not honour payments in respect to fees owed, and request to have your line unblocked. Other subscribers have reported success with this method. 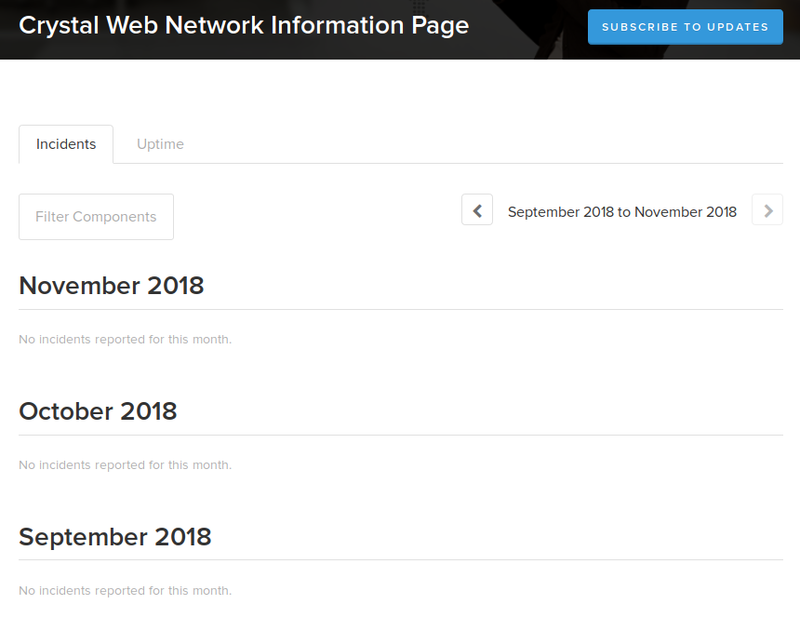 Before or on the 19th day of every month, you can optionally cancel your service with Crystal Web and request that your line be moved into the holding pool with Openserve. There you can choose to move the line back to another ISP to manage it on your behalf, or you can choose to move the line back to Telkom and bundle it with one of their voice packages or pay for a vanilla phone line and ADSL line rental setup. Alternatively, there is the option to stick it out and wait for the dispute to resolve itself and for the suspension to be lifted. That may take some time, however. I have not been given any expected date for the issue to be resolved. If you plan to complain to a regulatory body like ICASA, there is an open investigation that has been started by the regulatory body, to which you can add your voice by quoting the following reference number: KZN5306/18. Both Telkom and Crystal Web have been notified of the logged complaint, and will be responding in due course.